The 2019 Nissan Altima is entirely new from the wheels up. 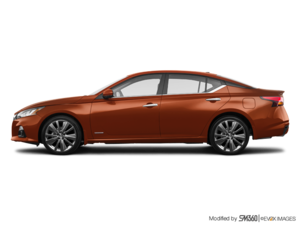 Completely redesigned with a sporty design, improved aerodynamics, efficient engine, and the latest in safety technology, the new Altima also gets some significant upgrades to its powertrain. Let’s take a closer look. Yes, you read that correctly. Every 2019 Nissan Altima will get all-wheel drive, which makes the Japanese mid-size sedan the second vehicle to feature AWD as standard equipment. For those who have experienced driving an AWD car in the past, you’ll know just how incredible it can be in the winter or on a wet road to have all four wheels steering you in the right direction. Entry-level Altima models also get a more powerful engine. With 188 horsepower and 180 pound-feet of torque, you get a significant increase in power despite keeping the same displacement. An eight-inch centre console is also standard, complete with Apple CarPlay and Android Auto. Moreover, every 2019 Nissan Altima will feature a wide range of active safety systems from the Nissan ProPilot Assist system. This technology provides a wide range of active safety capabilities, including adaptive cruise control, lane departure warning, and lane-centering. Lane-centering can follow curves in the road for you to make driving easier and more enjoyable. The sixth-generation Altima gets a new design as well, which was heavily influenced by the Nissan Maxima. With the new Altima, you get a bold visual signature on the outside while the interior features some of the most refined materials you’ll find in this segment. You’ll also get an easy-to-use centre console, infotainment system, and a ton of interior space. Check out the brand new Nissan Altima today at Trans Canada Nissan!